Jet lagged but luckily the staff at St. Moritz were happy to assist with a slightly early check in. We caught up on a few hours of sleep then went for a walk downtown (just around the corner from the hotel). The Kiwis certainly know how to do tourism well! This place is nice and clean and caters for young families as well as Gen X/Y back packers and us middle aged types! Even little things like water coolers designed to re-fill water bottles. We had a nice “pub meal” at “Ivy and Lola’s”, overlooking the wharf area. 1 scoop of ice cream from the parlour near the wharf is more than enough. 2 scoops was just plain greedy! Day trip to Milford Sound via coach. The coach driver played a pre-recorded audio file which provided a great back ground to the history of the area and the scenery and wildlife. Incredible scenery both en-route and cruising around the Sound. The tunnel through the mountain would be a must see to anyone that appreciates incredible engineering feats. We didn’t notice any food outlets there so we were glad that we had paid the extra $15 each for the lunch pack. Another couple and ourselves were separated from the rest of our coach group as we were booked on another boat which resulted in us being accidently left behind by the driver. The staff at Milford Sound were quick to rectify the situation and we were allocated to another coach to get back to Queenstown. Long day getting back around 7:30pm. We sampled the pizza at Lombardis. Excellent. In hindsight, hiring a car and making our own way to Milford Sound may have been the better option – pro’s and con’s. Did the cheap ($35ea.) cruise around Lake Wakatipu. Wayne, (the captain) was friendly, humorous and knowledgeable. Good value for money. We then walked up the hillto the Kiwi Bird Park. The mobile audio system was excellent. We hadn’t seen anything like it previously. The family that established the park are very passionate about conservation. Next to the Bird Park entrance is the Gondola that took us up to the Skyline restaurant where we celebrated our anniversary with a scrumptious buffet meal overlooking Queenstown and the lake. (may be the only way you can see the nocturnal Kiwis) as well as the conservation show. Decided to hire a car… and drove to Arrowtown, Wanaka and Cromwell. Again, like driving to Milford Sound, the scenery was incredible. Just be prepared for steep winding roads as you pass through various mountains. Went Kayaking on Lake Wanaka – should have dressed more appropriately for that experience. If you do this trip, allow yourself more time to check out all the wineries before they close in the late afternoon. 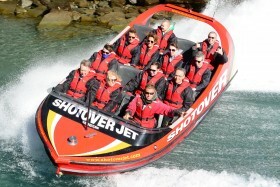 Time to check out the adrenalin pumping activities – starting with the Jet Boat ride on the Stopover River. Then I did the canyon swing while Tina watched on in terror. The people that work at these places really make it a memorable experience. We did the mandatory Saturday night queue for a couple of FergBurgers! Definitely very yummy; but if we didn’t have vouchers to use up we would not have worried about waiting 30 minutes in the queue then another 20 minutes for the order to be ready. 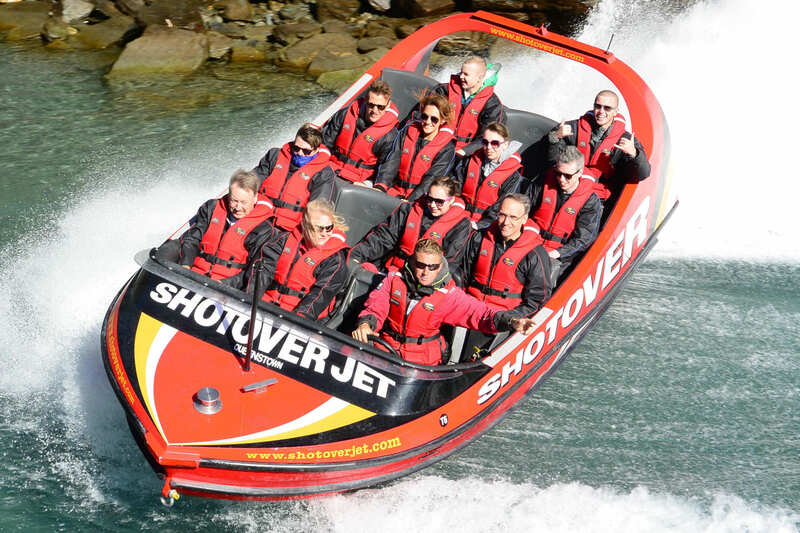 If you are going to do more than one of the jet boats, canyon swing, bungy, rafting, etc… buy a combo ticket and save money. Early start to get picked up for the white water rafting. A lot of preparation work getting geared up with untold layers of waterproof clothing, helmet and life jacket but all worked out in the end. Even the bus ride down into the canyon is an adventure in itself. All worth the effort as well as the chance to meet people from all corners of the world. We spent Sunday night travelling on the classic TSS Earnslaw on Lake Wakatipu and had a scrumptious BBQ buffet at a Sheep station homestead (Walter Peak). After the meal we saw a sheep dog and shearing demonstration. To top the night off, on the homeward trip, song books were distributed for those who wanted to sit around the piano. Do a weather forecast when you first get to Queenstown, then plan your activities based on that. Low cloud cover can affect how much of the scenery you see but recent rainfall means all the waterfalls are even more spectacular. The cold front (from Antarctica) that had been forecast arrived with gusto as we were blanketed with snow. As we are from Western Australia, this was a unique experience for us and a pretty cool way to spend the last day of our holiday. We decided to have a 1 hour hot spa experience where you can remove part of the roof (like a retractable garage door) and gaze over the now snow covered mountains of Queenstown. Magic stuff! .….. the list goes on!